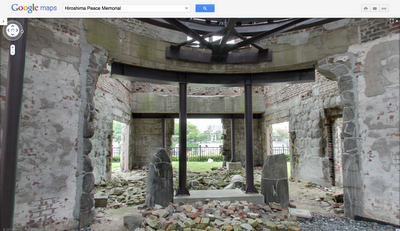 Street View imagery of the Hiroshima Peace Memorial. Known as the “Atomic Bomb Dome,” the Memorial bears witness to the devastation of nuclear war. The once proud pre-war structure nearly destroyed by the bomb still stands unrestored -- a monument to those lost and a powerful symbol of peace. Yesterday in Japan, we went one step further, making new imagery of the interior of the Memorial available via its Place page. While millions have visited the Memorial, you can only safely view it from the outside, standing behind a fence, because of the extent of the damage. However iconic the Dome may be, it’s difficult to comprehend the magnitude and scope of the devastation from the outside of the building. But with the support of the Hiroshima city government, we gathered hi-resolution imagery that actually enables you to “walk” through the building room by room, using the same technology we’ve used to photograph other historic monuments around the world. The difference here is that while you can wander the gardens of Versailles or streets of Rome in person, the only way you can access the interior of the structure is digitally. We launched this imagery in Japan on August 5th, one day before the 66th anniversary of the bombing of Hiroshima. You can access this collection via the Memorial’s Place page, or start exploring via this link. As with all of our special collections, we hope this imagery helps people around the world virtually travel to places they’d never otherwise have a chance to see. This past March, we announced Street View imagery of the Hiroshima Peace Memorial. Known as the “Atomic Bomb Dome,” the Memorial bears witness to the devastation of nuclear war. The once proud pre-war structure nearly destroyed by the bomb still stands unrestored -- a monument to those lost and a powerful symbol of peace.